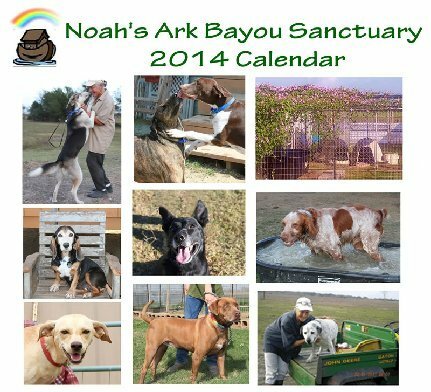 We are sincerely grateful that you chose Noah's Ark Bayou Sanctuary Animal Rescue to benefit from your 2nd Annual Puppy LOVE Fundraiser. We are happy that you share our vision for an all green earth-shelter "shelter-in-place" facility with a friendly home-like cage-free environment for our 'NO KILL sanctuary' precious rescues to enjoy until adopted. N.A.B.S. Team Volunteers, Nancie, Laurie, Nicole and myself all enjoyed ourselves immensely being in attendance. 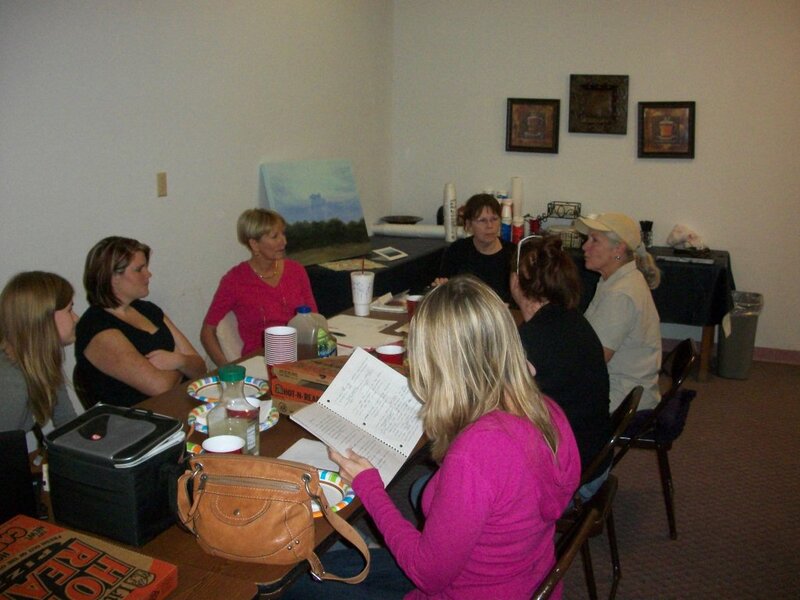 We were amazed at all the effort and hard work that your group put forth toward your goal on behalf of our rescues. You are each such a BLESSING to us and words can NOT begin to express our heartfelt thanks and appreciation for all that you have done with LOVE for our rescues. We look forward to working with each of you to help accomplish this goal and introducing you to all the deserving rescues at The Sanctuary. Thank you again & God bless each of you always! "On the weekend of March 29th N.A.B.S. 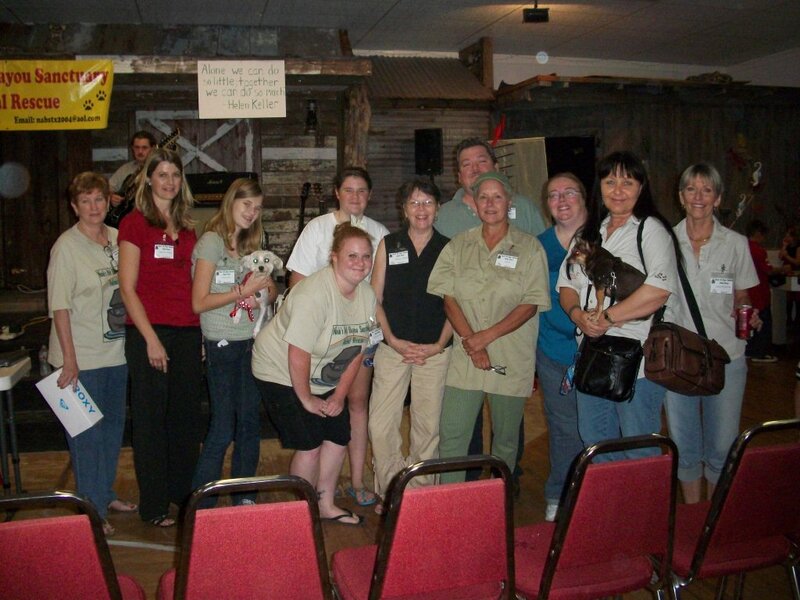 was invited to two special events organized by the Galveston Bay Parrot Head Club and MSR Houston Charities. 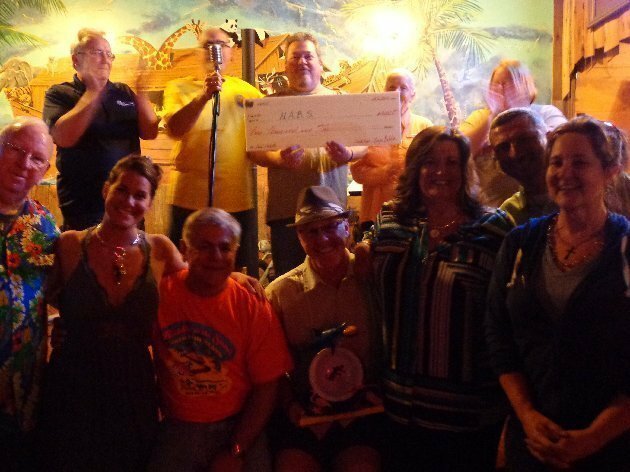 Both events amazingly raised the same amount for N.A.B.S. on the same day and presented their checks and donations to N.A.B.S. in the very same week. What a blessing it was for N.A.B.S. to receive the following donations in one week! 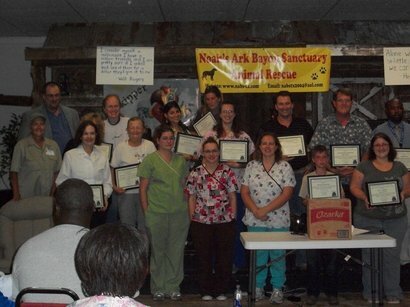 On Monday, 4/7/14, MSR HOUSTON CHARITIES presented N.A.B.S. with a $4,000.00 check along with the following donated items from our burgeoning wish list (: Fortunately we took Sandy's van to receive this donation of much needed supplies. N.A.B.S. sends a big thank you to James, Sydney, and Sandra and all others who participated in this event to help make it a huge success! 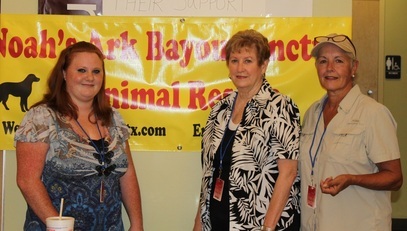 (LEFT TO RIGHT, MSR Reps, James Rogerson, Sydney Davis, and Sandra Steubing, presenting check to N.A.B.S. Pres. Pam Sanidakos, and Sandy Lado). Through the efforts and dedication of the people at both of these organizations, we are able to provide support, supplies and needed vetting for our precious rescues. Our heartfelt thanks goes to everyone that gave of their time, talents and money to make these events such a HUGE SUCCESS! Thank you and God bless you,"
Shortly before Christmas, we got word eleven dogs were destined to die in less than 48 hours in Galveston. The Galveston Rescue Mission has been completed!!! WE BROUGHT ALL 11 DOGS HOME FOR CHRISTMAS! 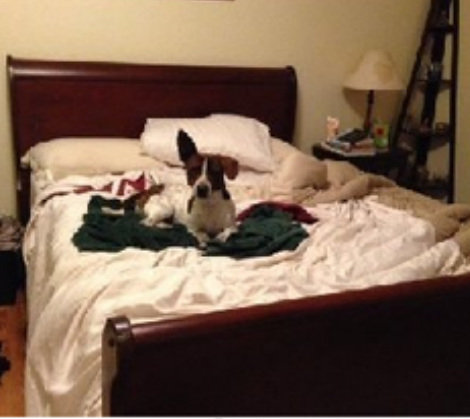 NOW NESTLED SAFE IN BED WITH HIS FOSTER!! Our volunteer transporters descended on the Galveston Shelter and delivered everyone safely to the Sanctuary after stopping by Dr. Bob's in Alvin for their rabies vaccination and some badly needed nail trims. Thank you for making this rescue round trip!!! A picture of one of the 2 lighted grapevine dogs at Tractor Supply in Alvin. 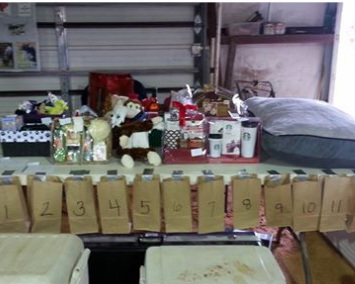 He was set up and decorated with ornaments listing items from the store that a customer could easily purchase for our precious rescues. Our 2nd lighted grapevine dog will be set up in a classroom at The Honor Roll School! N.A.B.S.' Online Calendar sales created, funded and managed by Jean Northington have made almost $900. so far and we still have more to sell! N.A.B.S. First Online Auction which was created and managed by Jean has realized great success too! 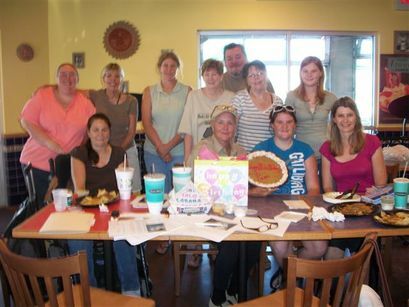 These creative ideas helped bring in much needed funds for our rescues! Thank you, Jean for your help! 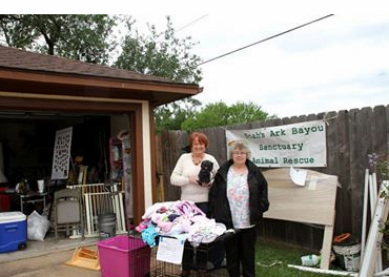 Many thanks to Janie on left and Brenda on right for having a garage sale along with Jean N. to benefit N.A.B.S. on April 19th and 20th, 2013. Thanks to A! 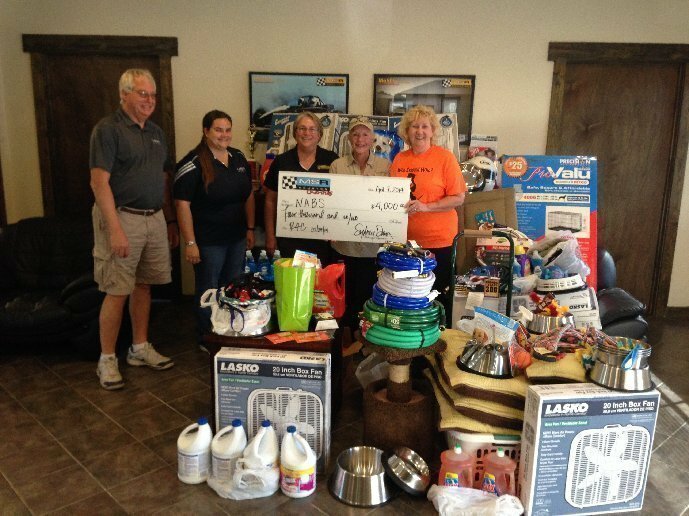 Woof Agility raffle we made $275 this week in agility trial raffles! Yea! These are held most every weekend in the fall by Laurie and Nicole and helped us care for the rescues many times. Alvin Community College students got some puppy love this week as they prepared for finals. They 'rented' puppies for a $1 from N.A.B.S. and got to cuddle, pet, and walk them for up to 20 minutes. 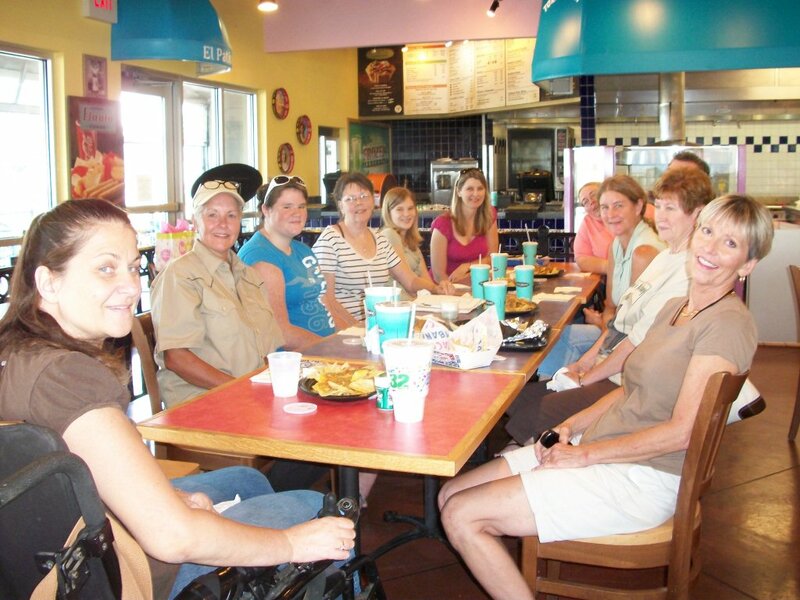 Thanks to these volunteers and many others, N.A.B.S. works! 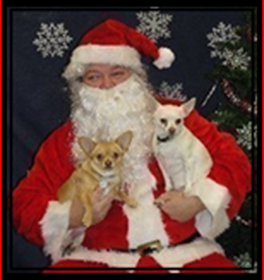 12/7/13: Santa photos were taken and Bob Lado was Santa Claus. Santa Bob will have pictures again 12/14/13. The Honor Roll School is an international private school in Sugar Land. A group of about 40 students came by bus to The Sanctuary for a field trip and hay ride on Friday 11/15/13 from 10-2pm and had a wonderful time. This school then had a fundraiser the following Friday 11/22/13 including selling donuts for breakfast and sack lunches. The first 75 lunches received a free N.A.B.S. calendar for their families. The proceeds totaled $1235. After reimbursement of expenses N.A.B.S. received $1000.. Sat. April 6th. 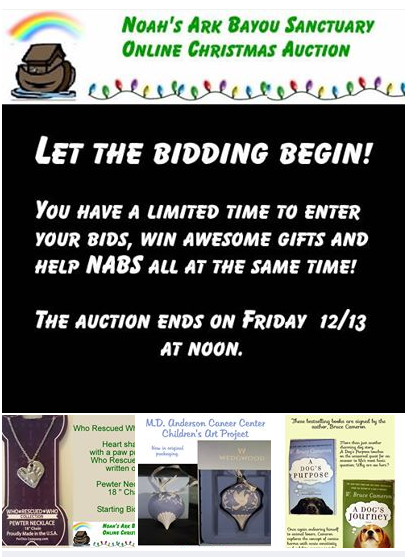 11 to 4pm there's a chili cook off benefiting N.A.B.S. rescues at Bayou Vista, Texas. 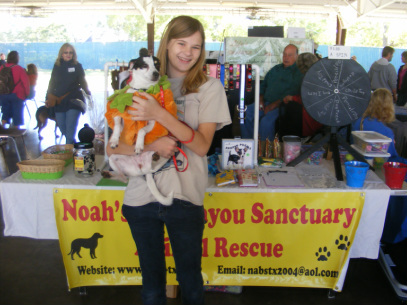 Some of our rescues will be there to greet you! 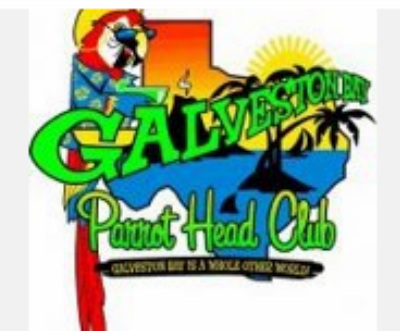 Please check Galveston's Parrothead FB page for directions and more information. Come join in the fun and help out our rescues at the same time. 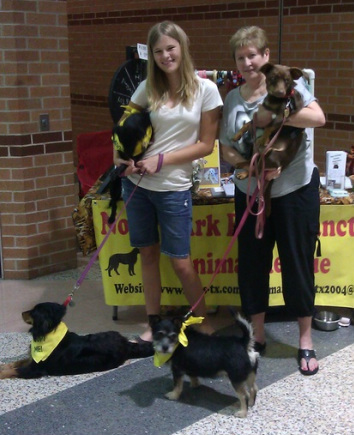 "It is a great relief to me to have had these funds to do the things we can't normally handle: collars, groomings, etc. It covered spays and neuters for 4 new rescues. The cold weather has increased the fuel expense to keep everyone warm and cozy. Thanks to The Honor School's generosity, we don't have to worry about these expenses. I have been reusing the best collars in order to send dogs to adoptions and the few sizes we had left to use didn't always work well for everyone. ..so now we will have an assortment on hand again to pull from and they will at least have on their 'Sunday best' when they take a trip to town," states Pam Sanidakos. 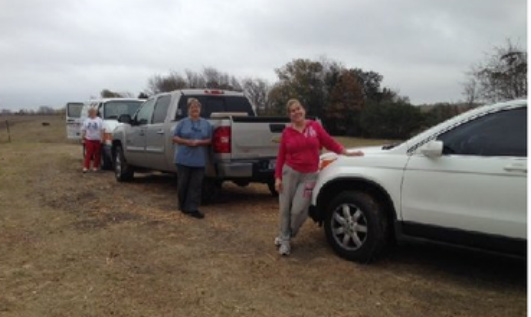 The Honor Roll School, hauling sand and mulch with the girls on the day of the hayride. The Honor Roll School boys working hard hauling mulch. We welcome in the new year 2013! Three at a time! That's quite a feat, Santa! 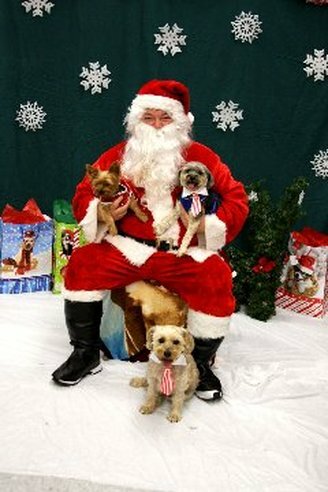 Santa came to Petco Dec. 8, 2012 thanks to Will and Nicole Doyle. The Doyle's are close friends of Santa. In fact, for the past 3 years they have been steadfast and faithful in coming to 'help' Santa take photos. Nicole does an amazing job, just check out the three dogs in the picture and you will agree. Santa even has snow on his boots! What a great photo! Thank you both for all your help. We all agree N.A.B.S. has the best Santa because we have the REAL Santa Claus! God bless Santa's helpers, Will and Nicole. Without you guys and your connection to Santa, we wouldn't be able to do this! 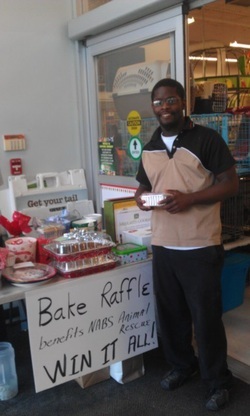 Trey, who works at Petco, won the delicious baked goodies on Dec. 8. He was so excited he invited everyone who worked with him to share in the feast! Congratulations Trey! Thanks to Allison, Sarah, Jean, Dru, Tessa, Laurie, Bea Ann, Jade, Nancie, Pam Sanidakos, and Pam Cundiff for donating baked goods, candies, other items so we could have a successful sale! We had to stack cakes and cookies two high so it would all fit on the table! Jade volunteered to help Pam C. announce our sale and direct guests to Santa. Jade brought her boyfriend along and together they did a great job helping raise money for N.A.B.S. Together we made a difference! The Thanksgiving Bake Raffle made a little over $450! Thank-you to those who brought baked goods: Dru, Jean, Tessa, Gaye, Dru's friend?, Sarah, Pam C, Bea Ann, and Laurie. 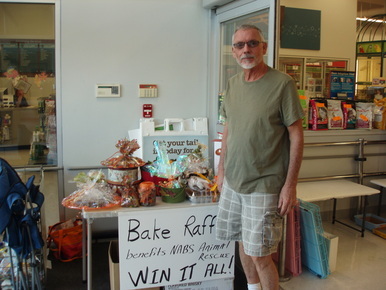 Without your donation of food we couldn't have had a bake raffle! The table was packed full. He is blocking part of the goodies in the picture. The winner, Lillian Pepin of Texas City, sent her husband to pick up the bounty! He was so excited about winning that he donated another $10! Lillian called Pam C the next day to say how wonderful all the food was. She said they shared with 5 families! Laurie and Nicole Stelling (pictured with Hardy) went to the 5th. 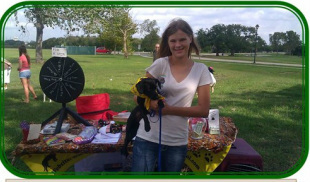 annual 'Trot For Spot' in League City during October 2012 to show support for Animal Alliance. 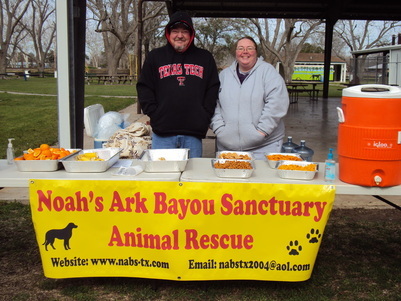 Thank you both for participating in rescue events on behalf of and representing N.A.B.S. What an awesome mother and daughter team! (Rudy in arms, Kotter of floor). 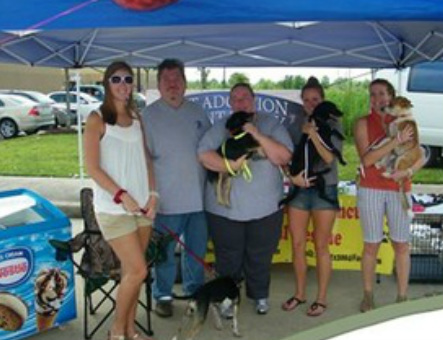 Jen (Maddie), Will, Nicole (Kotter), Tonya (Misty), and Sarah (Scout) at the Purina Adoption Event. Will and Nicole Doyle at Ride To The Rescue Event 2/2012. N.A.B.S. came up with a new concept: Legally, as a 501C-3 Nonprofit Organization, we can raffle! We raffled 'winner takes all' so the cook wouldn't have to cook desserts for Christmas dinner! Goodies were donated courtesy of Gaye Hart, Tessa Miller, Pam Cundiff (pictured), Dru Dalton, Bea-Ann West, & Lori-Bach-Hillman. Ho! Ho! Ho! God bless Will and Nicole Doyle for handling the Santa pictures. We have the best Santa around! You guys are great! Invited to attend Dish Network's 5th Anniversary Gala 2011! Tessa Miller, Dru Dalton, Pam Sanidakos at Dish Network 5th anniversary. The N.A.B.S.' gang 2010. Click photo to zoom in. Pam Sanidakos, President of N.A.B.S. presented certificates of appreciation to local business representatives who supported N.A.B.S. 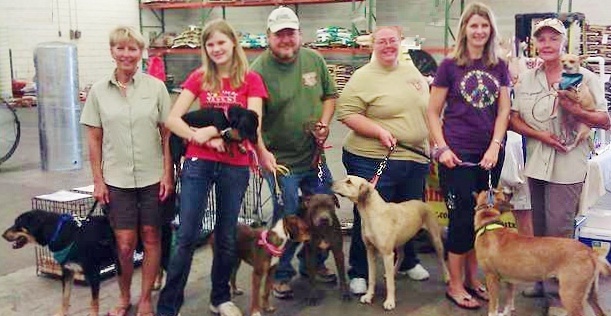 in 2010 at our first Annual Fundraiser. Mayor Reid of Pearland honored us by 'passing the leash' from our first donated service dog, Rocco to his new owner, Sherry Goevella of Pearland. Click photo to zoom in. Nicole Stelling at Woofstock Event with "Sara" in her arms. Having meeting and fun at Taco Cabanna. Click to zoom in. From left front: Sherry Govella, Pam Sanidakos, Randi Miller, Laurie Stelling. Back row: Nicole Doyle, Pam Cundiff, Cindy Dooley, Dru Dalton, Will Doyle, Gaye Hart, Nicole Stelling 2009. Click photo to zoom in.